Staying low carb is a great way to slim down quickly. 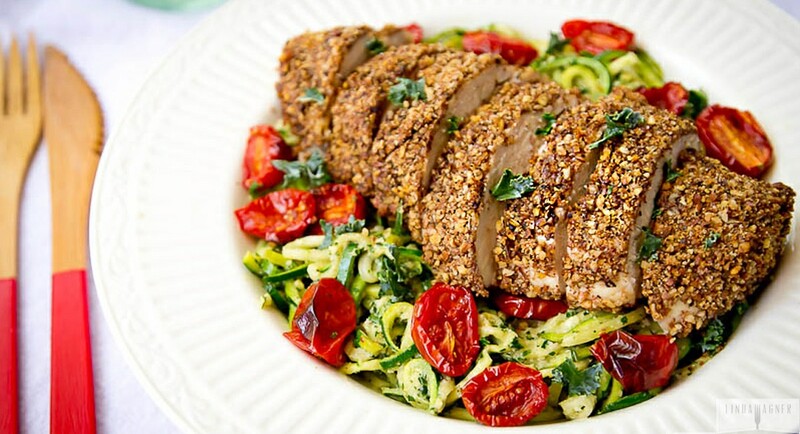 Carbs (even healthy carbs) can cause inflammation and water retention; so I’ve been switching it up with veggie noodles like in this Zucchini Noodles with Kale Pesto, Roasted Tomatoes and Pecan-Crusted Paleo Chicken dish. It’s SOOOO good. The chicken is amazing, and the pesto is a huge favorite of mine! 1. Preheat oven to 400°F; line a large baking sheet with foil and set aside. 2. You will need 2 large bowls. In the first bowl, add your pecan meal, salt, pepper and spices and mix thoroughly. In a second large bowl, crack 1 egg and beat with a fork or whisk until combined. 3. Dip each chicken breast into the egg mixture and coat both sides. Then dip the coated chicken into the pecan meal mixture, coat both sides and place on a large baking sheet lined with foil. 4. Bake your chicken for about 20 minutes or until cooked through. 1. In a food processor, process walnuts, kale, garlic, lemon, jalapeño, olive oil, salt and pepper and water until smooth, adding more water as needed to blend. Adjust flavors as needed and set aside. 1. Use a spiral slicer to slice the noodles into a “spaghetti” shape. If you don’t have a spiral slicer, a vegetable peeler can be used to make long, flat fettuccine style “noodles” or you can shred the zucchini using a grater or food processor. 2. Sprinkle your noodles lightly with sea salt and use your hands to toss. Place your zucchini noodles on a large baking sheet lined with parchment paper or foil, and place in the oven with your chicken for about 5–10 minutes, just enough to heat the noodles and dry them out a little. 3. In a large bowl, toss your zucchini noodles with pesto until well combined. Then top with sliced tomatoes.